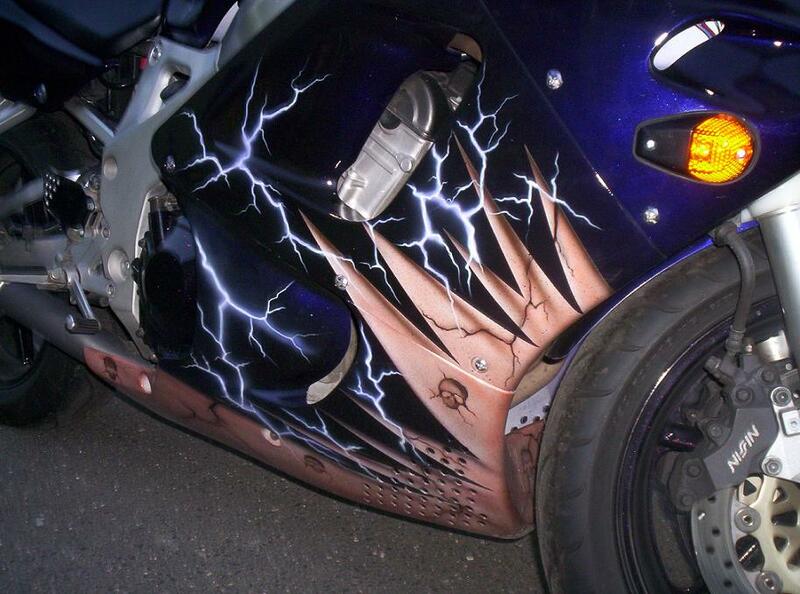 A one of a kind custom airbrushed Honda CBR900RR. This bike is definitely insane. A lot of time and effort went into this machine. This bike was recently painted purple. 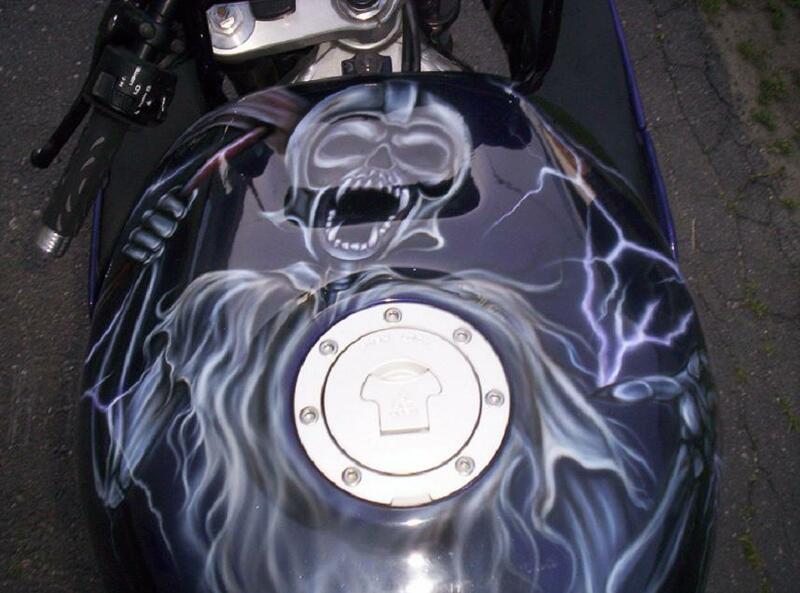 The airbrushing details and all of the skulls as well as the graphics took 3 months and countless hours. The cost was over $5,000. The wheels as well as some other parts are powder coated a sweet dark amethyst metallic. They look black on cloudy days but are really striking in the sunlight. Powder coating can be very expensive when doing more than one part. There is also a lot of upgrades done to this bike. It's not your ordinary boring ride. The bike has been expertly jetted. The exhaust upgraded to Two Brother's Racing Pipe. It has new tires with maybe 200 miles on them, new clutch, new high performance brakes. Carbon fiber mirrors, hand grips, shift lever and brake lever. Fender eliminator kit with LED lights and a new alarm system. I'm sure there is more to list but my mind is currently going in 12 different directions (with the wife right behind me making noise that sounds like blah, blah, blah). 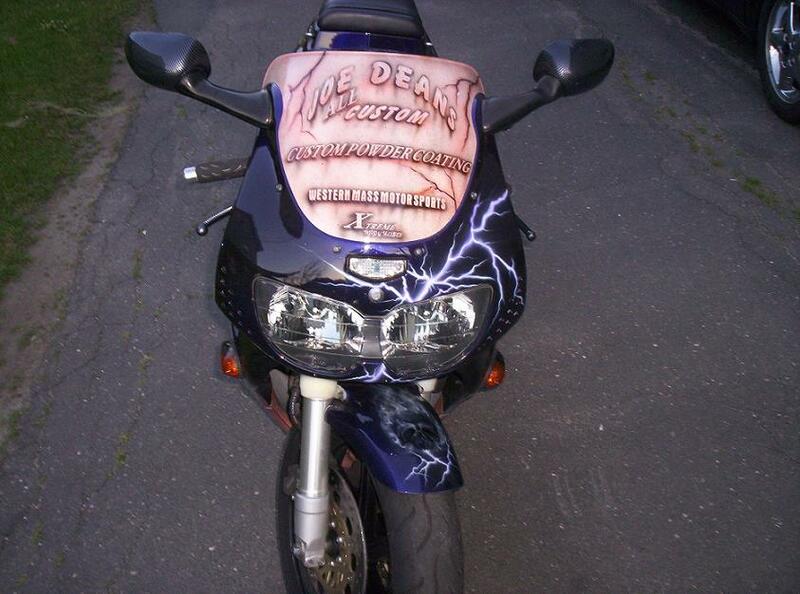 Speaking of the wife, that is why I am selling the bike. She won't let me keep it in the apartment anymore. Feel free to ask any questions and I will respond to you as soon as I can. 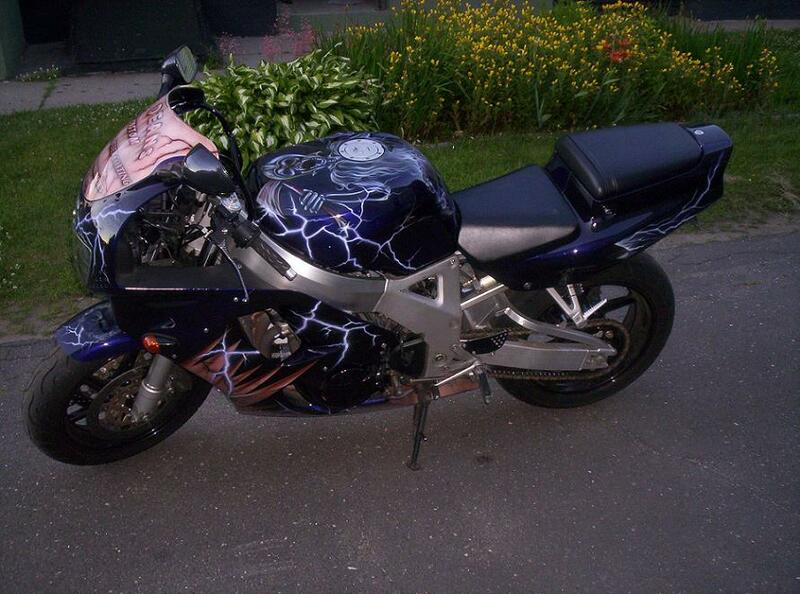 I can also get more pictures of specific items on the bike if you wish. Thanks for looking. I also entertain trades. But I will not give this bike away. Buy now cause price will go up tward springtime. And as soon as I can I will put pictures up. If you need em now pm me or email. [email protected]. thanks. How much do you want for it and where are you located? Sorry about that looking for 4500 or b.o. and i'm in western mass. Year and mileage? Also, what is on the windscreen? Can you get a better pic of that? Thanks. Its a 1995 and there is about 23000 miles on it. There is 300 miles since the total rebuild. Tires motor paint etc. I also included a picture of the windscreen. These are the people who helped make it happen painted on the windscreen. They gave me a small discount on stuff. Looking for 3800 or b.o. Need to sell soon!!! Price is now 4k or best offer. I just put a new battery in it. old one was no more. its gotta go soon. getting married in less than 30 days. I also entertain trades. But I will not give this bike away. whats your ideal custom harley?